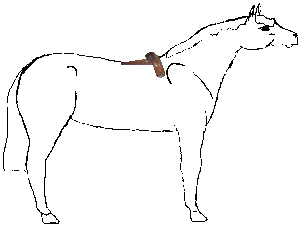 The typical English tree has a fixed structure, which establishes the length and width of the saddle, and helps distribute the weight of rider and saddle over the horse's back. 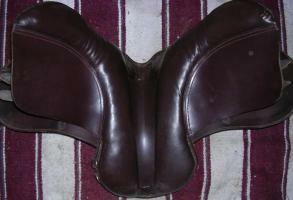 The English saddle also has panels which assist in this weight distribution. An exercise tree does not have any panels. All the weight of the rider is resting on the fixed tree itself. Note the shape of the "half tree" as compared to a full English tree. Where the English tree slopes backward and rests on the cantle--which is connected to both sides of the tree, and to panels--the half-tree ends in points. The English tree places pressure on a flat surface, above panels. The panels assist in distributing the weight of the rider; since the tree itself is flat and the panels are directly against the horse's sides, the tree should not create any pressure points. The half-tree places all its pressure directly on the tips of the tree itself. 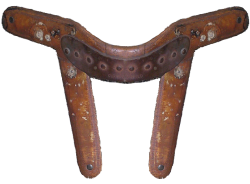 The half-tree doesn't distribute weight over a large surface; all the weight if rider and saddle are concentrated on just four pressure points (two on each side). A thick pad will not help distribute the pressure on those points enough to matter. The points are still there; they are still concentrating all the rider's weight in a very small area (2 or 3 square inches per point). A pad does not change the shape of the tree itself. Muscle "wastage," where the pressure is so great, that it cuts off circulation--That muscle begins to die after just 20 minutes without circulation. 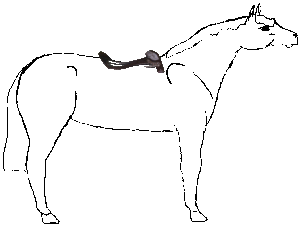 This is why so many off-track Thoroughbreds have a wither shaped like a dorsal fin. 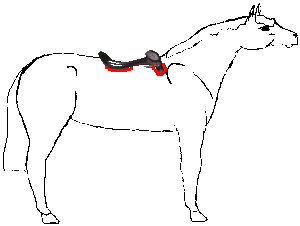 A wither *should* have muscle to either side, even on a Thoroughbred. Lack of that muscle is only "normal" because it's so prevalent, not because all TB's "should be" built that way. TB's should NOT be built that way. Extreme tension in what muscle remains--The horse tenses his back continually, bracing to avoid the pain of the pressure point. The anxiety and the continual bracing will eventually cause the muscle into a permanent contaction. This is why off-track Thoroughbreds often have a back that slopes sharply down from the spine, to either side. The muscles of the back should go first out, then slope down; on many TB's they just slant down. For information on treating tense or wasted muscles, see Therapeutic Equine Massage. Extreme tension in the long back muscles may also cause a noticeable "hump" in the spine, just in front of the pelvis. This is an actual change in the spine from muscle tension. If the muscle is caused to relax, the line of the back should smooth out. This tension and lifting/pulling forward of the spine causes the tips of the vertebrae to touch. When a bone touches a bone and there is no joint fluid, the bones themselves create calcification as protection. The bone-touching-bone will eventually fuse. Over time, the tips may rub against each other enough to fuse. 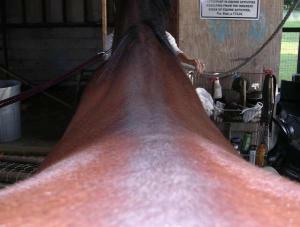 If the tips have fused, then relaxing the long muscles of the back will still provide some relief for the horse. 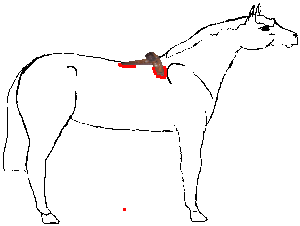 There may be some permanent change to the horse's back, but with more elasticity and ability to contract/extend in his back muscles, the horse should still feel improvement. His performance under saddle could also be enhanced by an increased control over the relaxation/contraction of those long back muscles. If the horse is much stronger to one side (and many are), the muscle tension may even pull the spine out of alignment. A chiropractor may be able to solve this temporarily, but while the muscle is still tensed, the will simply pull the spine out again. The muscle itself must be relaxed. This picture is a little exaggerated, as the horse was turning her head to the left. It does, however, clearly show both the "hump" and the slight pull to the right on the spine.